Your customer or prospect has just searched for you on their phone and instead they find your competitor in the #1 search result, they click on their mobile-friendly site, and your sales opportunity just vanished. Because you didn’t optimize your website for mobile devices using the correct SEO practices, your prospective customer has no idea that you offer lower prices and are a much closer, more reliable company. They haven’t seen any reviews for you. They don’t know your name, address, or phone number. Today you have lost a customer, and all their future patronage due to poorly executed SEO. Have you re-evaluated your site since Google changed its search engine algorithm? If not, that’s likely where your problem begins. Google made its biggest change to its search engine algorithm in late April 2015. Since then your Google Analytics numbers will have dropped and your website dipped in search result rank — especially if you are not considered ‘mobile-friendly’. Simply put this algorithm boosts the search results for those sites that are ‘mobile-friendly’ according to Google’s evaluation. More people search on mobile phones than on desktops now. “78% of those local-mobile searches result in offline purchases”. This is huge! If your site isn’t playing nice with search engines then you are definitely losing customers. Since search engines change their algorithms constantly, you are going to have to re-evaluate your websites for SEO on a regular basis. Every change that Google makes to its algorithms gets it one step closer to emulating how a human would try to recommend sites based on relevance to your search. Search engines have not reached full artificial intelligence yet (we may have to wait until 2045 for that). So until that time we need to bridge the gap and do our part to let Google know exactly what your website is about. Proper SEO fulfills that role and promotes your site in the most common-sense, straight-forward manner (at least from the perspective of a Google bot or web crawler). The first and simplest thing to do is check for these two files: robots.txt and sitemap.xml. The first gives search engines guidelines for what to search and what to search for as well as what to ignore. The second gives a map of your site with the logical structure of the pages. Usually you can find these files at the root of your website by going to ‘www.yourwebsite.com/robots.txt’ or ‘www.yourwebsite.com/sitemap.xml’. If you don’t find these files, then that’s a good indication that you need some serious help with your site. It can be tricky to know what to allow and disallow in the robots.txt file. It can also look like unintelligible code in a sitemap.xml so do your research or get a developer to help you with this bit. Google Analytics is important for the continued success for your website. It is a free service that you should sign up for and include on the site. It tracks your customers’ visits, clicks, browsers, device types, locations, and many more metrics that you will need if you want to know your customers better. It is difficult for a beginner to muddle through the creation of campaigns and goals for the metrics so this would be another area where you might want to have a developer help you. Along with Google Analytics you need to re-evaluate your keywords and continue your keyword research. Google has a Keyword Planner that can help you with determining keyword ideas. It requires a free AdWords account and is geared towards AdWords, but is quite helpful in determining the popularity of keywords and the kind of competition those terms have in searches. Google Trends is also a very good tool for identifying the frequency of search terms over time. It is sortable by region and topic and provides some useful information. Using basic HTML tags such as H1, title, META, and img alt attributes are necessary for web crawlers to make sense of your page structure. The title tag gives the name of the page and is usually one of the most important factors for keywords. You can find this at the top of the browser window (or the browser tab if you have multiple tabs open). Up there with the title tag is the H1 tag, which is usually the on-page header found at the top of the visible page and should describe what the page is actually about Examples of this are “Recipes” at the top of a recipes page, and “My Awesome Blog” at the top of a blog page. There are several meta tags that promote various meta-describers such as the ‘keyword’ meta, and the ‘description’ meta. There is even an ‘author’ meta to tell web crawlers who the author of the page is. The ‘description’ meta tag is what appears on the search results page in Google under the title tag. [insert image of this here] While this may not be the most important part for search engines, it is very useful for the humans that are trying to find out what your site is about before clicking. It is usually limited to 160 characters. Choose this description wisely! In the past the ‘keyword’ meta tag has been abused by site creators in order to try and trick the search engines into thinking that the page was about many different topics and thus give it a higher ranking. It is less effective these days because of changes to search engine algorithms that take this into account. It still describes what the site is about so using one or two really distinct keywords can’t hurt. Using many keywords might penalize you if the search engine thinks that you are trying to deceive it somehow. Web crawlers cannot see the images that you post so you need to include a description of what the image is about. This is where the img tag’s ‘alt’ attribute comes in. Also if the reader is blind, the screen reader software that they use will use this to read the description of the image to them. It is very important to include your social media buttons on the top of your site or ‘above the fold’ as we say. The very top is best to make sure that mobile visitors are able to see your links right away and make sure that you are also on Facebook, Twitter, LinkedIn, Google+, etc. While these buttons may not mean much to the crawlers as they search the site, the links generated from those other websites will make your site rank higher in search results. Linking the right ‘anchor text’ is crucial for SEO. Anchor text is the blue or underlined text that indicates that the word or phrase is a clickable link. Avoid using phrases like ‘CLICK HERE’ or ‘LINK’ for your links. You want to have links that are descriptive of what they are linking to. This way the web crawlers will know a little more about what you are linking to and also ‘trust’ the link a bit more or assign it more authority than other links that are less descriptive. Linking to other pages on your site gives the internal links more authority and also determines which pages hold the most importance. Having other people link to your site from theirs is one of the best methods of SEO. 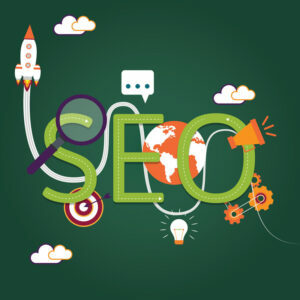 It is also one of the hardest methods of SEO to achieve. The biggest boost for this is unfortunately not a technical one, but a practical one. Having quality content on posts and pages is the biggest reason someone would want to link to your site. Don’t ever try to buy links! Tactics like this could get you demoted or even banned from search engine rankings! The constant changes to the algorithms like the one from April 2015 make improvements to more than just ‘mobile-friendly’-ness, they also improve the detection of ‘black hat’ or shady practices that some people use. The best practice in this case is to start a blog if you don’t have one and generate great content that will delight your users. Google prefers that sites practice Responsive Web Design (RWD). In order to achieve the best possible SEO and the ‘mobile-friendly’ status, the site should use effective breakpoints using the width of the screen to determine the layout, font-size, image size, and width of elements on a page. Using media queries, the site can determine how wide the screen size is and respond with the appropriate changes. If the screen size is narrow (less than 500 pixels wide) the site can respond appropriately by changing the font setting to be smaller or to make the image smaller so that it still fits on the browser instead of having to scroll horizontally to the right. Media queries can get complicated and confusing even for experienced web developers. Properly implementing RWD is essential to being a mobile-friendly site so hiring a web developer to write this for you is almost a must. Do you know if you have broken links on your site? Do you know how to fix them? An http message error of 404 means that the web page cannot be found. You have surely stumbled upon one of these error pages at one point. 404 errors are a big red flag to web crawlers and can seriously hurt your ranking if there are too many of them. Make sure to regularly check your site to make sure that there are no broken links and to fix any that occur as soon as possible. You can use a tool like Google’s Page Speed Insights for even more optimization evaluations. It will let you know if your site is considered mobile-friendly and provide you with a screenshot of how it appears on mobile. It will usually tell you to turn on Compression (GZip) for text optimization and to compress your images. Again, if you are not comfortable with performing these operations on your own make sure to do your research or get a developer to make the changes for you. Google has the biggest market share in online searches, but there are other tools available if you want to reach all of the other markets. -Bing has an Analytics tool tied to their advertising section. All of this technical tinkering leads to customers finding your site. This is the bridge that we must use to help customers cross over a search engine to find us — at least until Google becomes sentient. Until then the best way to ‘future-proof’ your SEO is to create a wonderful, well-designed site that gives your customers a reason to come back. Re-evaluate your site periodically or enlist the services of a developer to do so. R.C. Brayshaw can help you out with design and development of your website as well as integrated marketing campaigns involving print, email, and a refined web presence. Our web development team can give you a free evaluation for your site and discuss any changes you may need to make. Contact our Marketing Director, Sam Gordon, anytime at sgordon@rcbrayshaw.com or 603.456.3101. Where is the hub of your online presence?